Western Sahara Campaign calls on the UN Security Council to act against Morocco’s human rights violations and illegal occupation. Ahead of the Security Council vote on 25 April, the Western Sahara Campaign today wrote to all members of the UN Security Council, drawing attention to the ongoing human rights abuses carried out by Morocco. to be perpetrated against the people of Western Sahara by the Moroccan state. One high profile example this year was the ‘retrial’ of 23 Sahrawi activists in connection with the Gdim Izik violence that resulted in unwarranted and politically motivated sentences. Amnesty International reported that the court failed to adequately investigate allegations that the Saharawi were tortured in custody and included information extracted by torture as evidence. Read the report here. The letter from the Western Sahara Campaign calls on the UN Security Council to implement human rights monitoring in the Territory to protect the Saharawi against such abuses. It also highlighted the verdict in our recent legal case in which the Court of Justice of the European Union ruled that the fisheries agreement between Morocco and the European Union does not apply to the waters of the Western Sahara and further reiterates that the Moroccan occupation of Western Sahara is illegal under international law. The Western Sahara Campaign is a member of the Western Sahara Action Forum, the global network for human rights in Western Sahara. 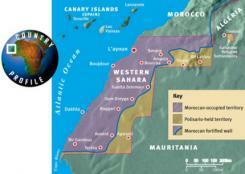 To get involved in the campaign for human rights in Western Sahara click here.